Welcome to Best Thing We Ate This Week, where each week, we'll have a special guest or Thrillist staff member talk about a New York dish they recently tried and loved. This week, Contra and Wildair's Fabián von Hauske names Wu’s Wonton King dumpling soup the perfect breakfast (along with some BYOB wine). Wu's Wonton King [on the Lower East Side] makes this cloudy, milky broth with pork bones -- I'm not sure what else it's flavored with but it's super-umami and full of flavor. They serve different versions of it, but the one to get is the three flavored dumpling one. 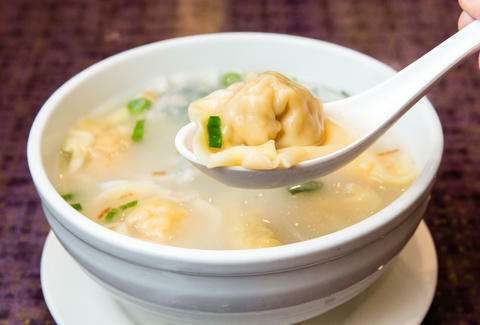 The different dumplings are filled with ground pork, shrimp, and crab. Everything at Wu's is super-flavorful, but so clean, and that's what makes this dish so great. The broth tastes like someone has been taking care of it for hours and hours -- it's very deceiving because of its cloudiness and its almost milky look, but the flavor is so intense of pork and seaweed, up to par with any "broth" dish that I've had at a three-star or fine-dining restaurant. I usually go here with my wine director Jorge Riera and some of the boys from [Contra and Wildair]; Jorge's really into Chinese food and small places and he got me into it. This most recent time I went with Jorge, our friend Chris, and our other friend Kris Yenbamroong from [LA's] NIGHT+MARKET. The best way to do Wu's is to go on a Saturday morning, order a bunch of the dim sum dishes, and finish with a big bowl of this broth. We usually get Jorge to bring a couple of bottles of wine and it's the perfect breakfast.